(Phoenix, AZ) Mitek Electronics and Communications is pleased to announce the promotion of Cynthia Nelson to Vice President of OEM Operations. In this new role, Nelson will lead the development and implementation of strategic planning for Mitek's OEM Innovations Group, shaping the group's competitive success as a brand partner and tier one supplier to new and existing automotive, marine, and power sports customers. "Mitek has seen substantial growth in our OEM division over the last several years in categories that we had not previously serviced and most of the credit for that goes to Cyndie", said Mitek President and CEO John Ivey. "Since joining our team Cyndie has brought an insiders perspective on OEM operations and has shown a remarkable ability to build and nurture relationships, sometimes over many years, and to turn those into great opportunities. Cyndie has always been and will continue to be a valuable part of our organization and her new position reflects our commitment to our people and our shared successes." Nelson started her career in the automotive aftermarket industry as a machinist, holding certificates in cylinder head porting for racing and high performance engine applications. After graduating from the University of Illinois at Chicago, she worked as a technical editor for McMullen Argus Publishing (Primedia), her byline appearing in numerous magazines; including Popular Hot Rodding, Off-Road Magazine, Motor Trend, and Hot Bike before transitioning her career to aftermarket parts manufacturing. Nelson has been with Mitek for 14 years and has held numerous key positions, working with MTX Audio and Atlas Sound. She was instrumental in establishing Mitek’s OEM team, bringing new process vision from the automotive industry to serve customers such as; General Motors, Ford, and Harley Davidson. 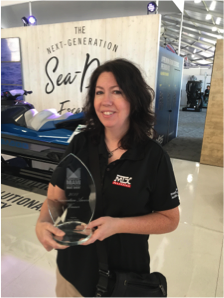 Most recently, as Director of OEM Sales, Nelson’s team successfully launched the first factory installed audio system for a personal watercraft with Sea-Doo, as well as the first portable audio system for Sea-Doo’s Spark platform. Mitek’s 2018 OEM sales are projected to be up 220% from 2016. Please join us in congratulating Cyndie Nelson on her promotion. Visit Cyndie and Mitek’s OEM Innovations Group at the 2018 SEMA Show, booth #33301.